I’ll try my best to translate the recipe in English! Marinate Chicken with salt, turmeric powder and lime juice for about 10minutes. 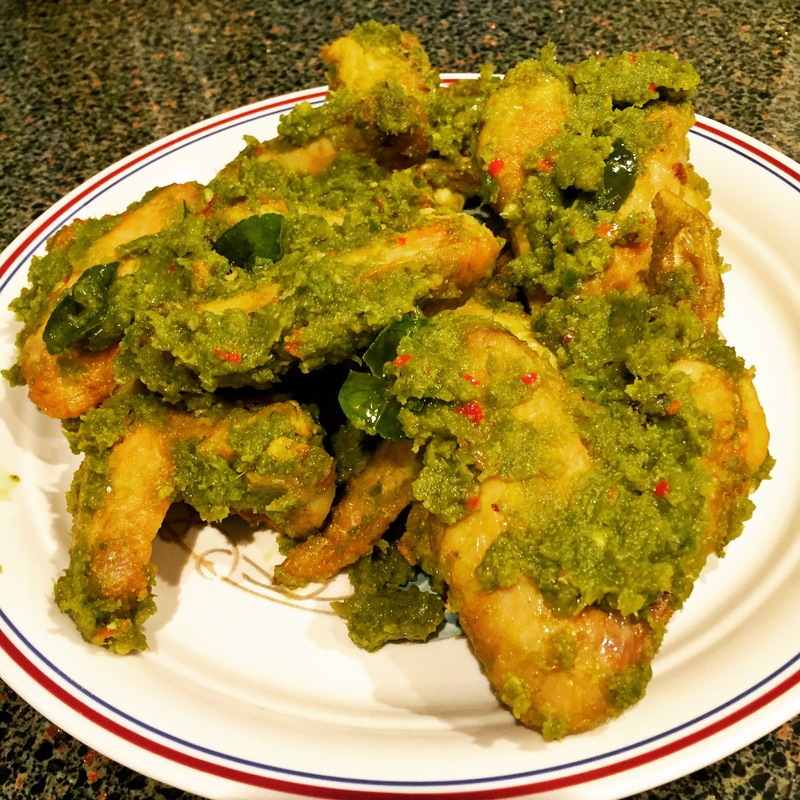 Deep fry or Air fry (20mins) marinated chicken until it is golden. Heat oil in wok and sautéed all the items that has been blended. Once Fragrant, add in the Kaffir Lime Leaves and the bruised lemongrass. And fry ingredients until it’s cooked (usually when the colour gets darker). Add in the fried chicken and mixed well until its fully cooked. Serve with plain rice. *Instructions: Whisk the ingredients together until the corn starch is dissolved. *Instructions: Whisk the ingredients until the corn starch is dissolved. 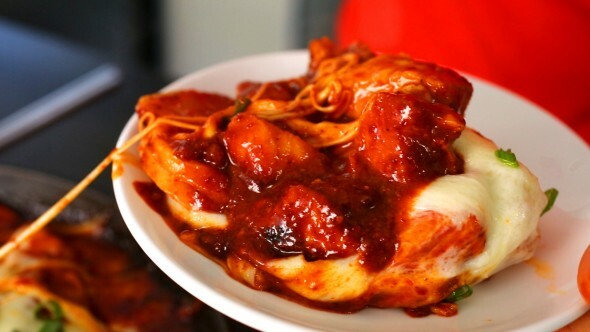 Massage the chicken with the marinade in a small bowl for half a minute. Allow the chicken to marinate for at least 20 minutes. Heat the oil in a wok on high heat. Once the wok starts smoking, turn the stove top off. Add the red peppers and peppercorns to the pan quickly stirring for 1 minute being careful to not burn the dried chilies. Add the chicken to the pan and turn the heat back on to medium high. Once the outer later of the chicken is cooked and no longer raw, add the ginger and garlic. Cook for an additional 2 minutes, stirring occasionally. 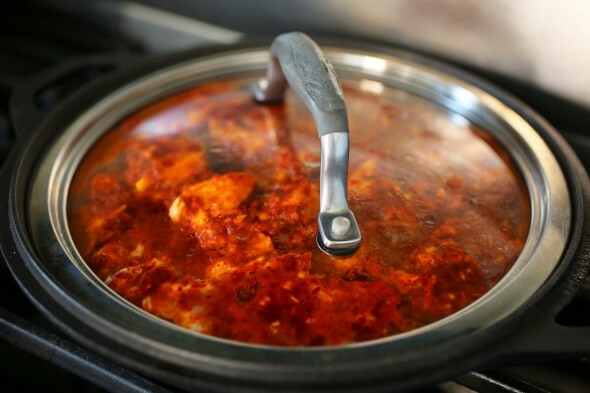 Slowly add the sauce a tablespoon at a time, making sure the chicken is absorbing all the flavors between additions. Once the chicken is done cooking, add the green parts of the scallions and peanuts. Cook for a minute or two longer. I might try making this after our EuroTrip! Looks amazing! 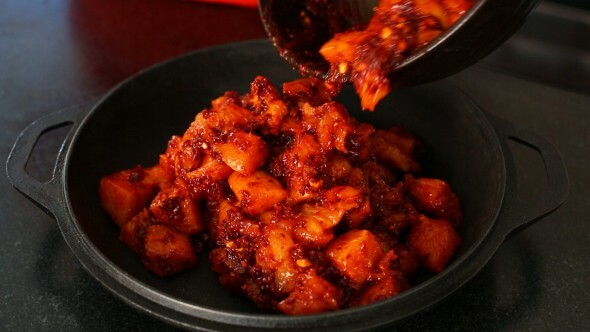 Combine hot pepper flakes, hot pepper paste, soy sauce, 2 tablespoons vegetable oil, ground black pepper, rice syrup, garlic, and ginger in a bowl. Mix it well into a sweet and spicy paste. Add the chicken and mix well by hand. Heat up a skillet with 1 tablespoon vegetable oil. 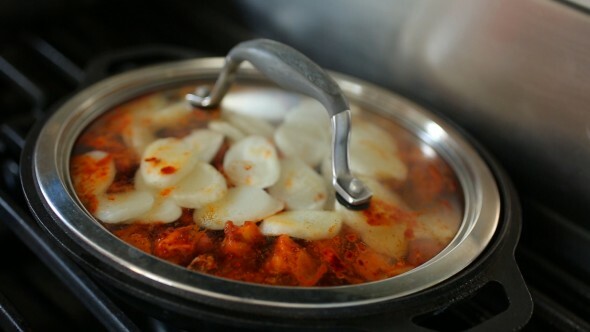 Add the sliced rice cakes and fry them for a few minutes. Turn them over with a spatula once or twice until both sides are crispy and light golden brown. 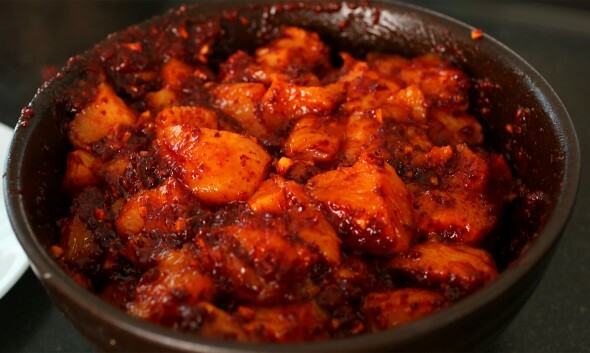 Place the marinated chicken into a heavy pan, preferably cast iron. Use the water to rinse the bowl and get the last of the sauce into the pan. Cover and cook over medium high heat for 10 minutes. 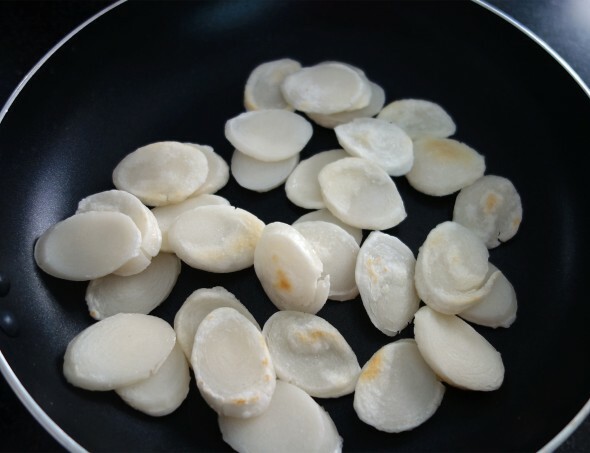 If you use a normal frying pan, it will take 7 to 8 minutes. Be sure not to burn the chicken. Uncover, stir and turn over the chicken with a wooden spoon. 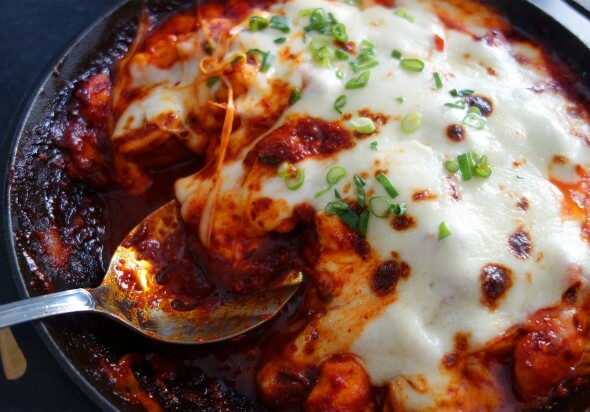 Add the rice cakes to the top of the chicken. Turn down the heat very low. Cover and let cook another 10 minutes, until the chicken is fully cooked. 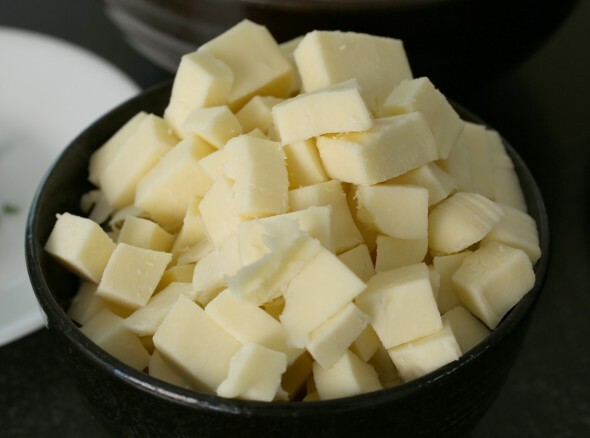 If you’re using cheese, pre-heat the oven broiler. 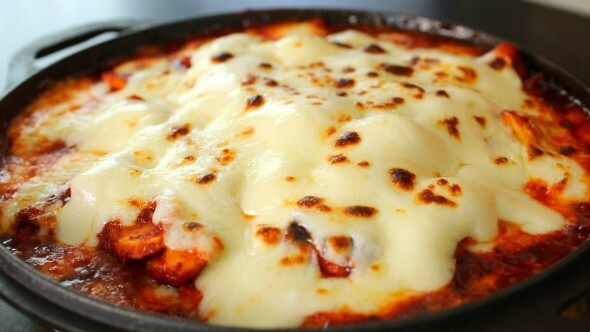 When the chicken is cooked, put the cheese over the top. 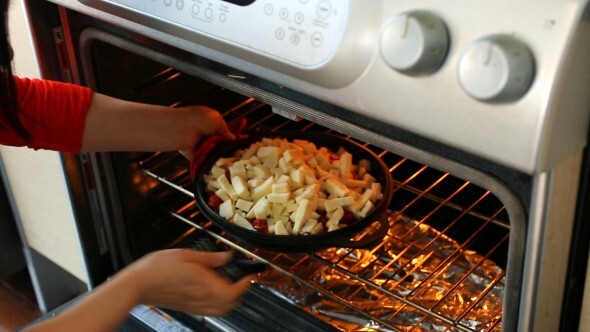 Slip it into the oven for a few minutes until the cheese is melted and bubbly. Remove and sprinkle with the chopped green onion. Serve hot.